The Headstand is practiced as the first of the 12 Basic Asanas (steady pose). 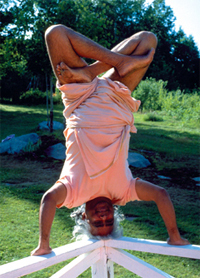 It is regarded as the “King” of the estimated 84,000 different asanas. By inverting the body and keeping it in a straight line, the pull of gravity is counteracted and enhances deep breathing, bringing an increased oxygen supply to the brain and sympathetic nervous system. The headstand is one of the most powerful asanas for the body and mind, a virtual panacea for all human ills. “He who practices the Headstand for three hours daily conquers time” -Yoga Tatwa Upanishad.